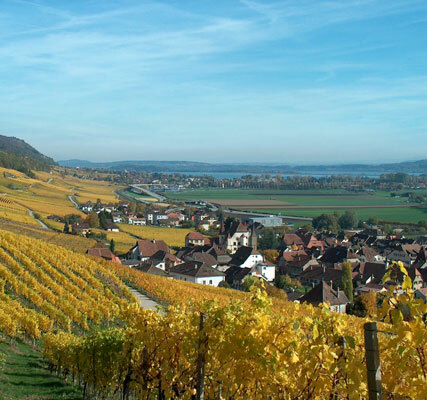 The area between Lake Neuchâtel and Lake Bienne is locally known as L´Entre-deux-Lacs (Between two Lakes). Situated at the foot of the Jura mountains, the village of Cressier has a fine castle and many impressive mansion houses, most of which date from the 15th century. The vineyards are perched along the lower slopes (which can be very steep) of the Jura, between 430m and 550m (1,420 ft. and 1,820 ft.) above sea level. The deep relationship between the village and its vineyards has inspired numerous writers and painters, the most famous of which are without doubt Jean-Jacques Rousseau and Gustave Jeanneret. Located around the neighbouring villages of Cressier and Le Landeron, at an altitude of 430m (1,420ft), our Domain`s vineyards cover an area of 6ha (15 acres) with an additional 3ha (7.5 acres) tended by other local wine-growers. Pinot noir covers about 50% of the total planted area, Chasselas 35%, Chardonnay 5%, Pinot Gris 5% and Gamaret 5%. All of our vines are cultivated in strict respect of the environment whilst using the most modern wine-growing techniques. 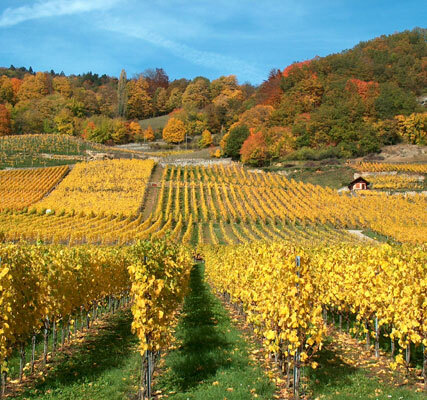 The vineyards are on a slope of 10-30%, in order to capture the maximum amount of sunlight. The soils of the region are typically red, sandy and calcareous. Each grape variety has its own personality, and the nuances from the different micro-environmental conditions found on our Domain gives a complexity to every one of our wines. 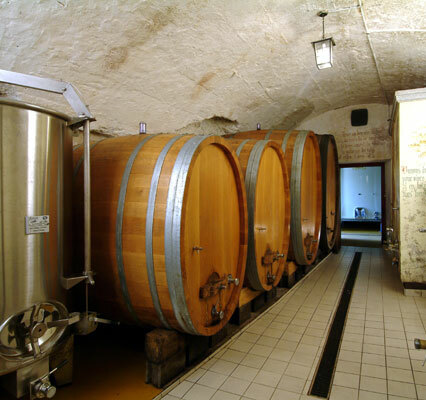 Dug into limestone bedrock, our cellar contains steel vats, oak tuns (for making red wines), and wooden casks (barriques) for our sweet wine, Farandole and ours Creation. 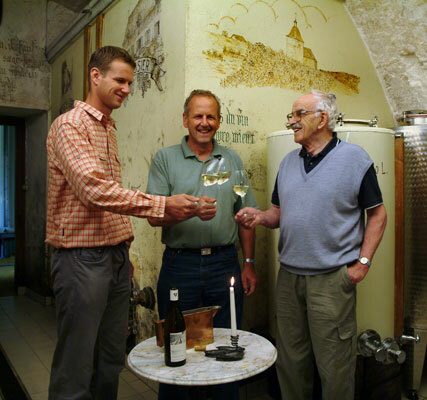 Our wine-making techniques are modern whilst at the same time respect both tradition and the grape variety. Gentle pressing, strict control of the temperature during fermentation, methodical monitoring and scrupulous hygiene enables us to offer wines of recognised quality. We put all our heart and know-how into the development of our wines. Wine-growing was first established in the region by the Romans, in the 4th century A.D. However, wines had been growing naturally in the local forests beforehand, but had never been cultivated. In the 12th century, the name “Ruedin” makes its first appearance in the written records, and by 1614, the domain was already known in Cressier. During this period, wine-growing was closely linked to the Church, particularly the monks, who had to make wine for mass. The villagers at this time would have been mainly self-sufficient farmers and wine-growers.